Clothing and fashion styles during the colonial through pre-Civil War eras in North Carolina did not change as quickly as in modern times, but North Carolinians were undoubtedly aware of what was "in style" and what was "old-fashioned." The concern for clothing and fashion was greatest in the wealthier classes of society, while the lower classes, generally occupied with making a living, had less interest in and opportunity for keeping up with new clothing fashions and designs. Wealthy women and men often attired themselves in clothing of British and French styles. As in the modern era, Paris often dictated the latest fashions. Upper-class colonial women wore very large hoop skirts of imported silk or satin, wooden stays or corsets to slim their waistlines, and high-heeled shoes. The gentleman's wardrobe might have included red velvet coats and tight doeskin knee breeches, ruffled silk shirts, silk stockings, silver-buckled shoes, and possibly a small sword or sword cane. Children of aristocrats sought to duplicate adult fashion, even if that meant the girls wore uncomfortable stays. People of lower economic status usually relied on homespun materials-a cotton-flax mixture (fustian cloth) and flax and wool (linsey-woolsey)-for their clothing requirements. Small farmers often wore homemade jackets and pants, wool socks, heavy boots, and flax-wool shirts. Farm wives made do with a shapeless dress of fustian. Homemade garments, including dresses made from bleached and dyed cotton sacks, were still in style in some places through the Great Depression. Slaves typically were issued a yearly "ration" of clothing by their masters: men might receive a suit and pants of coarse wool or cotton, two pairs of shoes, several shirts, and a hat, while women were given one or two dresses, several shifts or field gowns, and two pairs of shoes. Brightly colored handkerchiefs were worn by both black men and black women. Beginning in the post-Reconstruction period, North Carolina and other southern states increasingly began adopting national standards of dress. The influence of the mass media of the late 1800s and early 1900s in hastening this nationalization of the South was profound, particularly the role of women's magazines, some of which began prior to 1870 and spread knowledge of clothing and fashion. Godey's Lady's Book (1830-92) was a pioneer of such publications, especially under the editorship of Sarah Josepha Hale (1837-77), who included hand-colored plates and pictures of ladies and gentlemen in stylish costumes. Godey's was the supreme arbiter in matters of fashion and standards of propriety, and it was the model for later magazines such as Ladies' Home Journal (1853-), Good Housekeeping (1885-), and Vogue (1892-). The impact of industrialization, the increased availability of ready-made items, higher quality sewing machines, and inexpensive patterns all combined to eradicate sharp class distinctions in fashion. In the mid-1800s manufacturers began to make inexpensive, ready-to-wear clothes, which saved customers both the time it would take to make clothes themselves and the money they would spend on clothes made by a dressmaker or tailor. New fibers also began to be developed, and North Carolinians and other Americans increasingly began to dress for comfort as well as style. In general, North Carolina women have experienced the trends in fashion that have characterized the entire nation: hemlines have risen and fallen; waistlines have shifted, disappeared, and reappeared; and the areas of focus have moved from head to bosom to legs and back again. In the state, as elsewhere, the leading department stores employ buyers whose business it is to keep in touch with fashion design and to attend fashion shows in New York, California, and elsewhere with an eye to upcoming styles, colors, and fabrics that will appeal to their stores' clientele. The best-known fashion designer with a North Carolina connection is unquestionably Alexander Julian. Born in Chapel Hill, Julian operated Alexander's Ambition, a menswear specialty store in Chapel Hill, before moving first to Philadelphia and later to New York City, where he became president and chief executive officer of Alexander Julian, Inc. He has won several Coty fashion awards and was elected to the Coty Hall of Fame in 1980. He also won the Cutty Sark Award in 1980 and 1985 as outstanding U.S. designer. Unlike many designers, Julian created his own fabrics, working with mills in England, Scotland, Italy, and the United States. The manufacturing of fabric apparel is a huge, often volatile industry in the state. A large variety of women's, men's, children's, and misses' apparel is produced in the state, including men's and women's suits, coats, overcoats, shirts, underwear, neckwear, dress and work gloves, robes and dressing gowns, and belts. "Fashion Trend-Setting Tar Heels," Spectator (8 Mar. 1984). Steve Levin, "Over the Rainbow: Alex Julian Left Chapel Hill for the Big Apple to Seek His Future in the World of High Fashion," Carolina Lifestyle (September 1982). 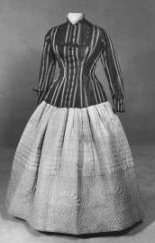 Two piece, brown and beige striped corded taffeta jacket with tortoise shell buttons in floral motif; hand-quiltedbeige taffeta skirt (petticoat), circa 1865. Available from the North Carolina Museum of History. Available from http://collections.ncdcr.gov/ (accessed October 5, 2012). Men's shirt, pullover, long sleeves, buttons at neck and sleeves; worn by Gen. Samuel Finley Patterson, ca. Available from the North Carolina Museum of History. 1830. Available from http://collections.ncdcr.gov (accessed October 5, 2012). White, pointed high heels, "straight" design, ca. 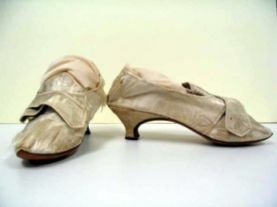 1760; worn by Mrs. Wilson Blount (signed on soles). Available from the North Carolina Museum of History. Available from http://collections.ncdcr.gov (accessed October 5, 2012).